PureVPN is one of the best VPN providers which allow users to experience ultimate online security and true freedom. May you want to access content that is restricted in your region, buy cheap flight tickets, get better discounts, or evade past restrictions enforced by your ISP, PureVPN does it all. Every year, PureVPN offers unimaginable discounts on Black Friday. Last year, the Black Friday deal was so attractive, it was picked up by dozens of deal websites and publishers. Surprisingly, it was also labeled as the best Black Friday deal of the year. All the positive hype around PureVPN can be attributed to the company’s mission of making the internet a safe place for humans. PureVPN believes that privacy and anonymity is a basic human right. It is this belief that drives the VPN provider to offer increasingly better discounts annually, so that everyone can keep themselves safe online, especially during Black Friday, when cybercrime picks up its pace. This year is no different. PureVPN is offering Black Friday deals once again on humongous discounts. Black Friday is not here yet, but PureVPN has already made the Black Friday deals live, and is getting a lot of positive response from around the world. News websites, bloggers, and deal websites have already begun featuring this Black Friday deal, which is on its way to becoming the best deal of the year. Mashable needs no introduction. It is a global, multi-platform media and entertainment company. Powered by its own proprietary technology, Mashable is the go-to source for tech, digital culture, and entertainment content for its dedicated and influential audience around the globe. 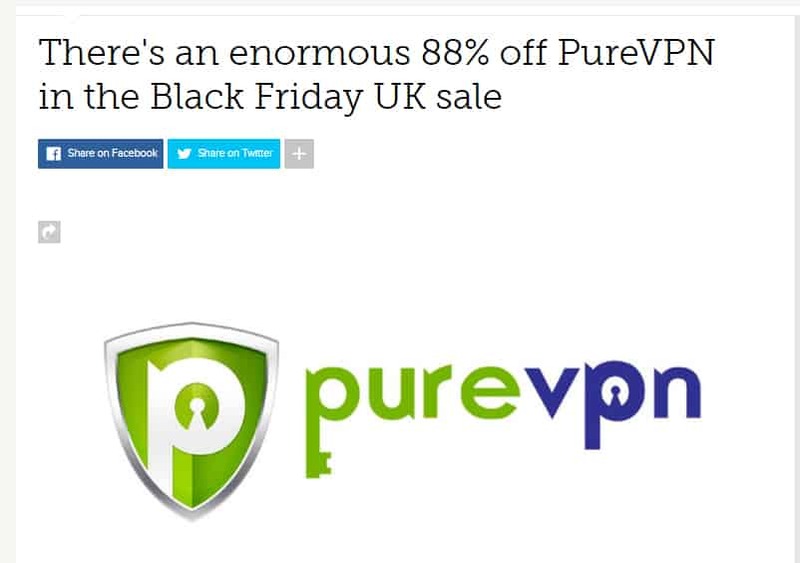 PureVPN, the best cybersecurity tool, is featured on Mashable for its amazing Black Friday deal which is offering an extremely big discount. Black Friday VPN Deals is a website that focuses only on VPN deals that can be utilized during Black Friday. Every year, thousands of users visit this website to get an idea about which VPNs are best performers in terms of service as well as discounts. 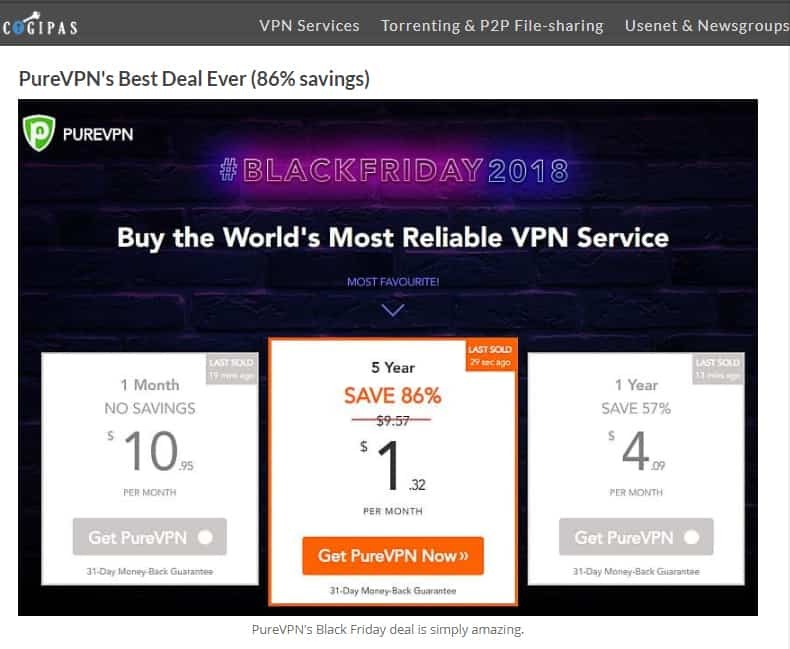 PureVPN tops the list on vpnblackfriday.com, in part due to its excellent reputation and in part, due to the amazing discount, it is offering. 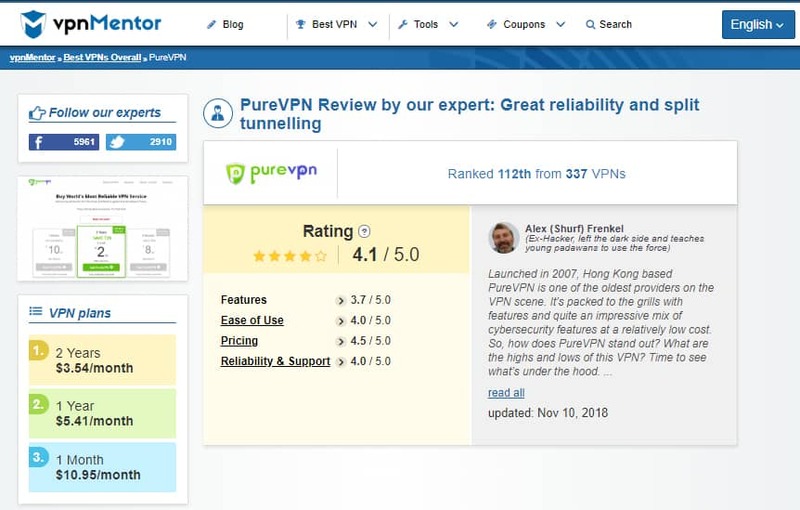 VPN Mentor is an authentic review site that lets actual users themselves review and rank the VPN and privacy products and service. It aims to offer users a really honest, committed and helpful reviews when navigating VPNs and web privacy. On the website, PureVPN has a Pricing review of 4.5 out of 5. This means that out of every 10 people who have used PureVPN, 9 think that it is very affordable and totally worth the money. 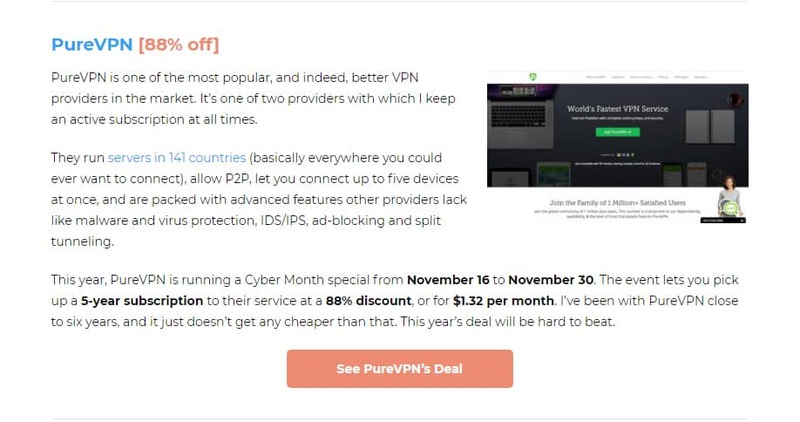 With Black Friday deal now active, PureVPN is “unofficially” the most affordable VPN you could get your hands on. TechRadar is the largest UK-based consumer technology news and reviews site, with thousands of daily users from US and Australia as well. The website has tons of best tech deals, reviews, product advice, competitions, and so much more, which makes it an attractive bet for most visitors looking for discounts this Black Friday. The same humongous PureVPN discount is posted on Tech Radar as well. If you have seen their website before, you will know that whatever they say and quote has authenticity and credibly. With strong ties to all the major manufacturers, as well as incredible product knowledge built from years covering the consumer tech industry, Tech Advisor is uniquely positioned to tell users and influencers what to buy, and when to buy. BestVPN.co provides support and information about the top privacy tools via hours of rigorous testing/reviewing. This helps individuals around the world receive maximum anonymity online. PureVPN tops among all other VPN providers in Black Friday deals on this website. The same great discount offered here too is valid from November 16 onwards and will be available through Black Friday. PureVPN’s Black Friday deal is available on this website too. 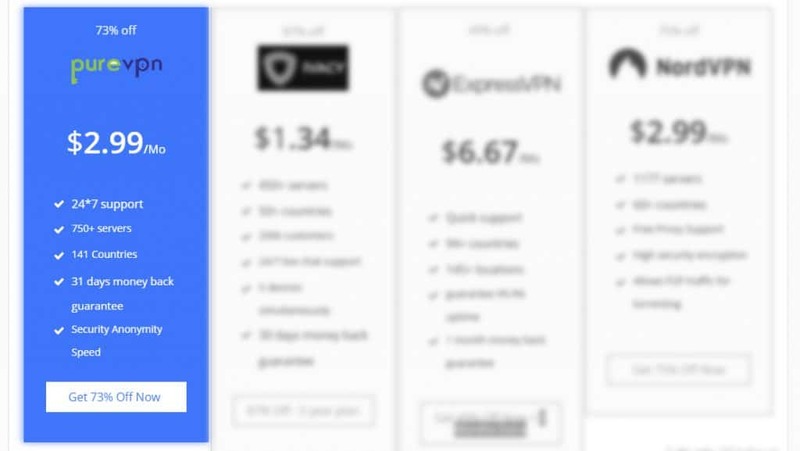 While it is placed on number 6 on this website, PureVPN does not actually rank at number 6. 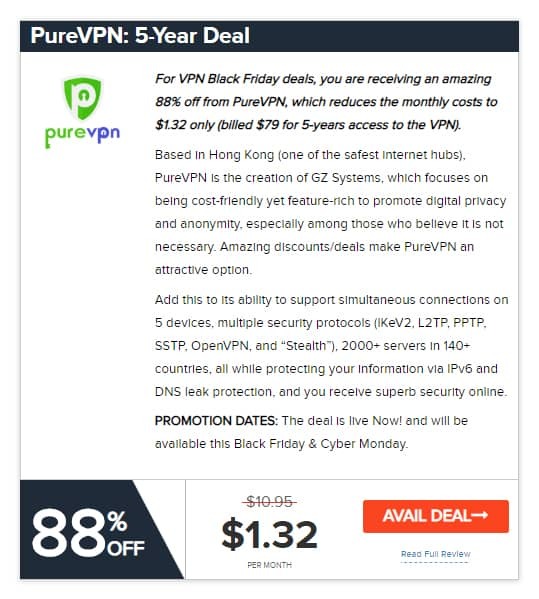 The website just puts together all the best Black Friday VPN deals and PureVPN is one of them. Another great review website, cogipas.com is one of those who keep users privacy and security their top priority. Apart from providing reviews of great VPN services, they also support many causes that aim for the betterment of humans, mostly in Africa. 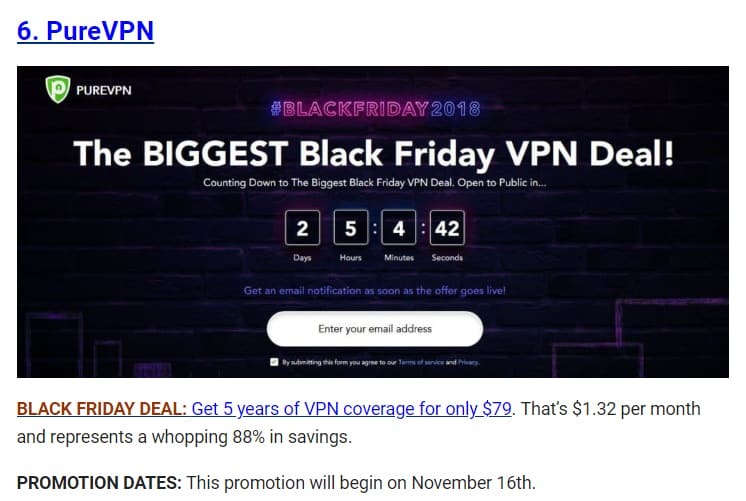 PureVPN’s Black Friday deal is difficult to miss on this website. Featured on the homepage, the Black Friday Deal of 2018 offered by PureVPN happens to be the website’s top pick. Fastest VPN Guide is committed to giving you unbiased and in-depth tests, reviews and comparisons of VPN service providers, as well as any relevant news, information, and guides. Its main focus is on speed but also considers other important factors that go into rating a VPN, like privacy, server locations, features, ease of use and price. The website aims to give you the most accurate and impartial information. This way, you can make an informed decision and pick the perfect VPN provider to suit your needs. This Black Friday, make use of the best-ever deals on PureVPN and get an amazing discount for a lifetime! Remember, privacy first! How To Setup VPN for Roku?